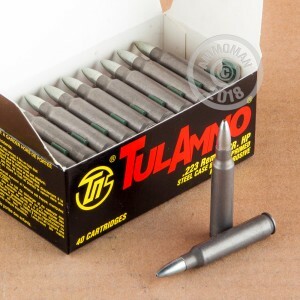 Suited for both low-cost pest control and target shooting, this .223 Remington ammunition from Tula is an excellent choice for your AR-15 or other .223/5.56 NATO rifle. Each cartridge in this box of 40 fires a 55 grain hollow point bullet at a muzzle velocity of 3,241 feet per second. This gives it ballistics similar to those of M193 ball ammo. 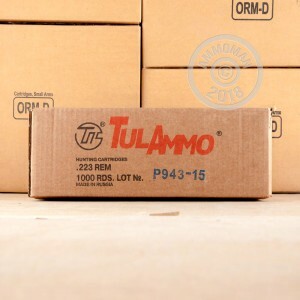 Tula ammunition is loaded in Russia and uses non-corrosive Berdan primers and steel cases. 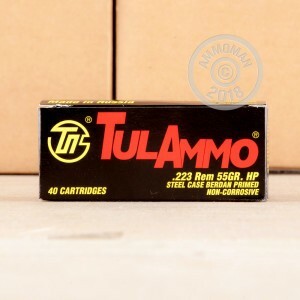 The steel cases are not reloadable, but contribute significantly to the ammo's lower cost and provide reliable cycling thanks to their polymer coatings. All orders over $99 at AmmoMan.com ship for free. Place yours today to reap the savings!